One of the first things a Doer encounters when he or she starts a new job is an intensive recruitment effort by cliques. Coworkers who hold a negative view of the organization will pull the Doer aside to warn him or her about whom can be trusted and whom to watch out for. Cliques provide a biased history of how to act and who to pay attention to. 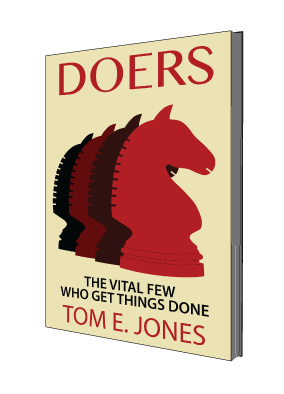 At the same time cliques with a positive view will attempt to recruit Doers because they too are eager to do well. Thus the new employee is immediately torn as to which clique to join. To the sought after Doer it feels much like a return to junior high school. Whenever ambiguity exists and there is no formal way to determine which direction to take, Doers are prone to form their own cliques in an effort to gain support for their way of thinking. The decision to join or form a clique can have serious consequences. If management views a clique as disruptive, its members will be labeled accordingly. The consequences could be fewer promotions or dismissal when a reduction in force is called for. On the other hand Doers who join cliques that management views as “good” are rewarded with promotions and increased job responsibilities. Management can take steps to curb the formation of energy draining cliques. These steps must begin when the Doer is first hired. Management should focus on welcoming the Doer by assigning a workplace guide who can show him or her how things things get done. This indoctrination process should begin at the moment of hiring and continue for the first 30 days. The workplace guide should meet the Doer upon arrival and there after make certain someone takes him or her to lunch every day for the first few weeks. The Doer’s supervisor should also stay involved in the welcoming process and be accessible so that he or she has someone to go to when faced with uncertainty. Doers seldom hesitate to say when they are confused. By admitting they need clarification, Doers are better able to garner useful information from credible sources. Admitting to being confused allows the Doer to explore the basis of the ambiguity and get clarification thus enhancing his or her chances of joining the right clique.